Bluford Shops adds Toledo, Peoria & Western to the hobby company’s collection of HO scale transfer caboose models. This fully assembled release is available in two distinct road numbers. 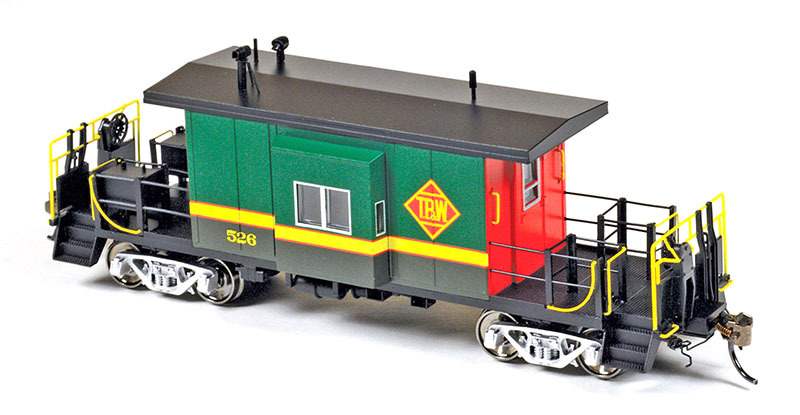 There are a number of recent additions to Bluford Shops line of transfer caboose models. 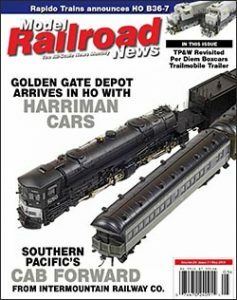 CSX; Toledo, Peoria & Western (TP&W); and Union Railroad are among the recently released short-body, bay window models. These highly detailed and great-looking models are available in N and HO scale. A Midwestern railroad favorite, TP&W provided an east-west connection for railroads across Illinois that bypassed the busy hub of Chicago. TP&W’s important main line was basically a straight line just short of 300 miles running from Logansport, Indiana, to Fort Madison, Iowa. The road connected with Santa Fe at its western terminus and Pennsylvania Railroad at its eastern end, as well as with many other lines along its path through northern Illinois. Peoria, Illinois, served as the road’s home base, and the East Peoria Yard with Nickel Plate crossing one end and running along the length of the facility made for a must-see stop for any railfan visiting the area. Pennsylvania Railroad and Santa Fe acquired TP&W, and the two roads enjoyed the benefits the line provided them as a small, but integral piece of a transcontinental run. The road’s Pennsy ownership transferred to Penn Central and became exclusively under Santa Fe control after Conrail’s arrival in 1976. Santa Fe absorbed TP&W completely in the early 1980s. Santa Fe didn’t retain the TP&W long, however; the road made a comeback in mid-1987 as a regional system with a fleet of ex-Santa Fe GP20s for power. Today, TP&W is a member of Rail America’s corporate family. For a great many railfans, the “real” Toledo, Peoria & Western ceased to exist on New Year’s Eve 1983 with the merger into Santa Fe’s system and dispersal of its diesel and equipment rosters. During its prime diesel years, TP&W owned a collection of cabooses that ranged from fairly typical steel bay window models to a few standard cupola steel roster members to a pair of transfer bay window prototypes. 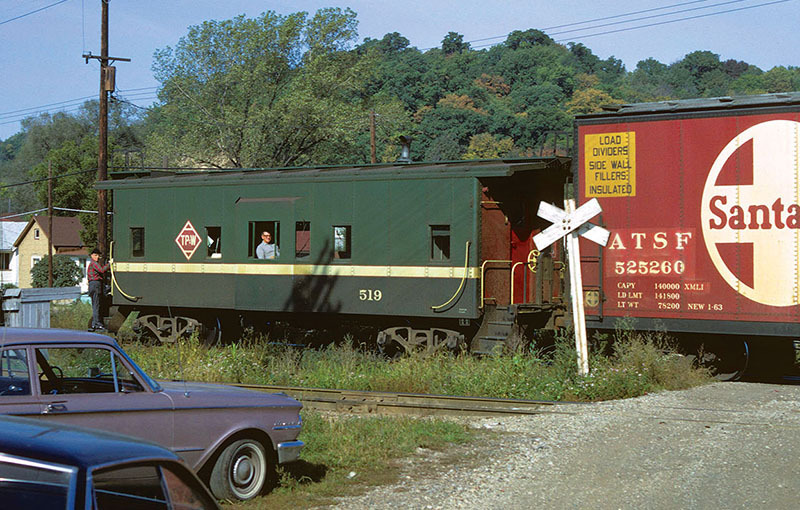 According to reference information in Paul H. Stringham’s Toledo, Peoria & Western book, the railroad employed letters to catalog its caboose roster prior to World War II. 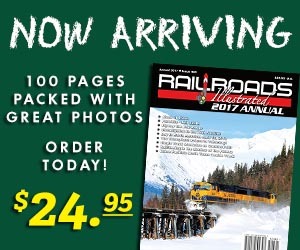 The roster, appearing in the book’s appendix on page 131, shows TP&W cabooses 501–506 were initially numbered in the 200s. 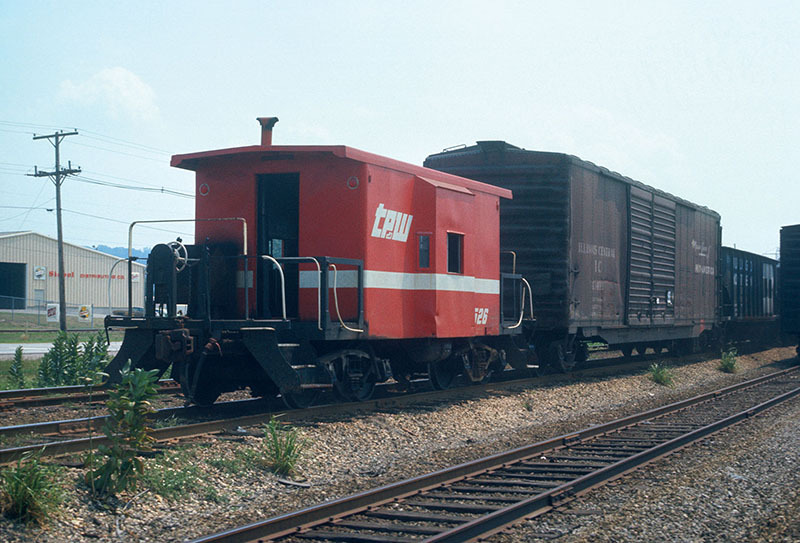 The railroad later changed from letter designations and 200-series numbering for its caboose collection and began numbering its end-of-train equipment in the 500s. The road’s collection (as of this published late 1982 roster) shows 17 examples (500–530) with several open slots in the span of 31 numbers. The two transfer bay window cabooses (525 and 526) appear to have been built by the road’s shops in the mid-1950s. Though they had similar bodies, originally TP&W’s 525 rode a flatcar platform and possessed long porches. Research shows TP&W’s long-platform 525 enjoyed a shiny silver finish during the 1950s. The silver scheme and long porches went away in the 1960s in a rebuilding that sent TP&W’s 525 back to service with a length similar to the road’s 526 short bay window caboose. These two transfer bay window cabooses saw many years of service and received TP&W’s vermillion-and-white decoration that arrived in the late 1960s. The cabooses remained on the roster through 1983. The detail on this HO-scale transfer caboose model is very impressive, as is the excellent application of the various colors. Bluford Shops did a very commendable execution Toledo, Peoria & Western paint scheme, right down to yellow handrail accents and eye-catching silver truck sideframes. Bluford Shops continues to impress with its quality models produced for N- and HO-scale model railroads. This recent Toledo, Peoria & Western pair of short-body bay window caboose models is no exception. The fully assembled HO-scale model rides on metal wheels and comes with metal knuckle couplers. You’ll find the complex paint scheme expertly replicated on this new Bluford Shops offering. The platform and frame appear black with the caboose body featuring two-tone green sides with red ends. A yellow horizontal band runs the lengths of the caboose sides just below the lower frame of the bay windows. The band includes thin, red outer lines separating the yellow from the dark Pullman Green hue on the lower portion of the caboose sides with the lighter green upper section. This HO model not only looks good, but operates great too! The 33-inch metal wheels and body-mounted metal knuckle couplers enhance the value of this release. Note the underframe with its air line and brake rigging details, as well as the fine-scale coupler cut levers on the ends. The railroad used a diamond-shaped herald that went through a number of revisions during the road’s lifetime. This model presents a red diamond with yellow outline and yellow “T.P. &W.” with thin horizontal yellow lines over and under the road’s initials. The caboose road number is presented in an accurate yellow typeface replicating the prototype well. End railings and various grab irons appear in yellow, matching the hue applied to the caboose body. Finishing the fine appearance of this Bluford Shops’ TP&W release are silver truck sideframes. Clear window material is flush-fit with silver frame outlines. The bottom of the model features excellent underframe detail, which on this model is finished in a flat black color. The model’smetal knuckle couplers match up fine with a Kadee height gauge. The 33-inch metal wheels roll silky smooth on this model, and all axles had wheels in proper gauge. You’ll be able to add TP&W’s vermillion-era livery in the near future with Bluford Shops coming pair of releases featuring the road’s speed-letter block initials that appeared around 1970. As these illustrations show, there will be two versions of placement for the 500-series numbers on the coming TP&W releases. Paperwork provided by Bluford Shops shows an exploded parts diagram. There are no parts for the owner to install on this release. The model comes wrapped in clear film and is securely held in a clear, two-piece shell inside the manufacturer’s familiar window-display cardboard box. If you’re a TP&W fan, you’ve likely enjoyed and bought a number of TP&W diesels and rolling stock produced over the last 20 years but noticed that matching cabooses have been uncommon. Bluford Shops helps remedy this TP&W shortcoming with this pair of two-tone green models. 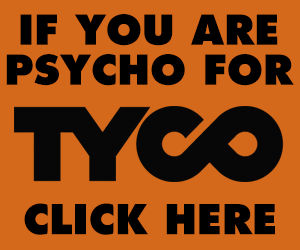 A late-era, red-orange or vermillion TP&W caboose release is coming from Bluford shops. Using the same short-body bay window caboose tooling as found on the two-tone green TP&W cabooses, this future release will include the road’s slanted block lettering logo and late-era rounded numbering typeface. 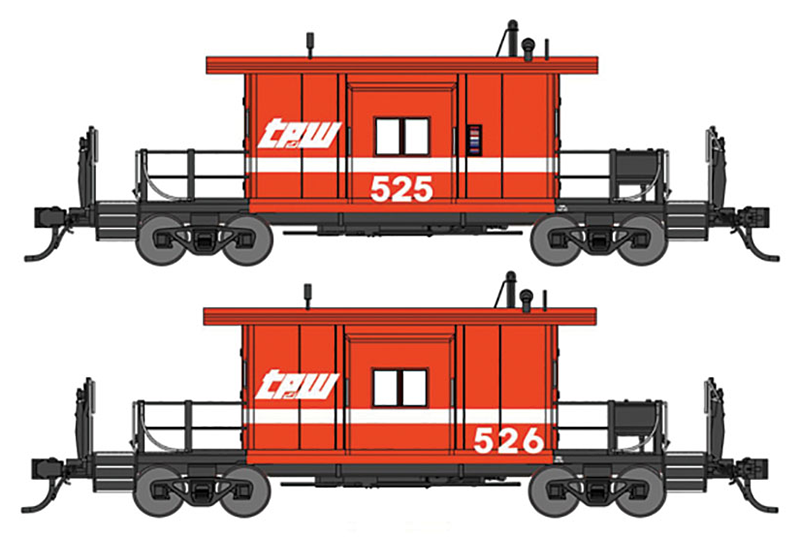 Bluford Shops will offer these coming vermillion-and-white TP&W cabooses in both HO and N scale. Be sure to check out May 2018’s “From the Archive” for more Toledo, Peoria & Western coverage.